If you are looking to try and save money sometimes attaching a pipe to a bridge is the more economical way. BHI has several years of expertise in this area. Give us a call and see what we can do for you. BHI has been directional drilling for 2 decades. We were one of the first to own a directional drill in northeast Kansas and we continue the tradition that was started back in the 1980’s of not walking away from a completed bore. This area has seen the most growth in the telecommunications industry in the past 4 years. From out first FTTX project in 2004 to present, this industry is changing and we are ready to provide you with best service possible. BHI has over 20 years of experience in this area. From copper splicing to Fiber splicing, we can handle your project and you can rest at night knowing that we have the most skilled people on the job for you. 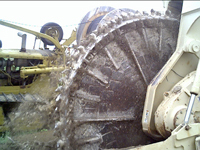 Limestone, Flint, or Granite no matter what type of rock, we have the necessary equipment to complete the project. 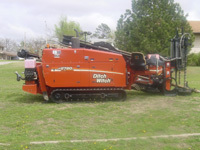 With the addition of our Ditch Witch 2720 AT in 2006 we are now capable of drilling solid rock. Sometimes there is no other choice than to bore. 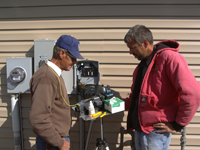 Let our knowledgeable crew help you complete your water line or gas line crossing.